Varagur is a beautiful small village on the bank of river Kudamurutti,near Thiruvayauru in Tanjore district. 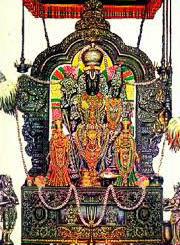 The moolavar (main deity) of the Sri Venkatesa Perumal temple is Sri Narayanan, known here as Sri Venkatesa Perumal. Moolavar Sri Lakshmi Narayana Perumal also known as Venkatesa Perumal is seen in a seated position with thayar Lakshmi in His lap. According to archaelogical records, this deity was originally instituted as Sri Lakshmi Narayana by the Paranthaka Chola King also known as Veera Narayanan. The moolavar, utsavar deities are from the Chola period of architecture. Sri Narayana Theertha Swamigal an ardent devotee of sri Narayana, came to this village from Andhra Pradesh, following the banks of the river Kudamurutti. He stayed at a place called Nadu Cauvery for the night. Narayana Theerthar was suffering from acute stomach ailment. That night in his dream an old brahmin appeared and asked him to follow the first living being he sees on waking up. He sudenly woke up and saw a 'swetha Varaham' (white pig). He followed the pig through a small village. The pig went inside the Venkatesa Perumal temple and disappeared. Narayan Theerthar realised that it was the bhagawan Himself who came in the form of Varaham and showed him way to this temple. He realised that his stomach ache had also disappeared. Since his visit, the village came to be known as Varahapuri (வராஹபுரி), which later came to be known as Varagur (வரகூர்). To him Srinivasa perumal appeared to be Sri Krishna with Rukmini and Bhama. He heard a heavenly voice asking him to sing in praise of sri Krishna about Krishna's leela with gopikais. Till this date Sri Narayana Theerthar's Sri Krishna Leela Tharangini is sung and celeberated in a grand manner during the month of 'Thai' (mid January) every year. This famous temple is situated in the village agraharam ( a place where usually all the brahmins of the village lives) facing east. The temple itself is small with one praharam. In front of the moolavar, we can see a carving of Sri Anjaneya in a dancing pose in one of the pillars. It is beleived that he used to dance to the tunes of Sri Krishna Leela hymns. Uriyadi festival of Varagur is very famous. The festival starts every year during the day of Gayathri Japam and Uriyadi ( breaking of the pot tied atop a 40 feet bamboo pole) celeberated on the following day of Sri Krishna Jayanthi. The day after Uriyadi is celeberated as Sri Rukmini Kalyanam and ends with Sri Hanumanth Jayanthi. The festival is celeberated for 10 days and with Veda parayanams by celeberated Sanskrit scholars, bhajans from various artists that goes past midnight. People of Varagur, wherever they are assemble here to celeberate this festival. Many NRIs from Varagur coincide their vacation dates to attend this festival. Sri Krishna Leela Tharangini is sung and celeberated in a grand manner during the month of 'Thai' (mid January) every year. Artists from various part of Tamil Nadu and also from other states perform during the two days festival here. Other interesting Features One is said to find a good job immediately if he prays in this temple sincerely and promises to offer the first month salary to the Lord here. Temple locationA few kilometers from Thiruvayaru in Tanjavur District. The nearest rail head is Budalur station between Trichy and Tanjavur. If you are driving from Chennai, it can be reached via Ariyalur, Thiruvayaru, Kandiyur. 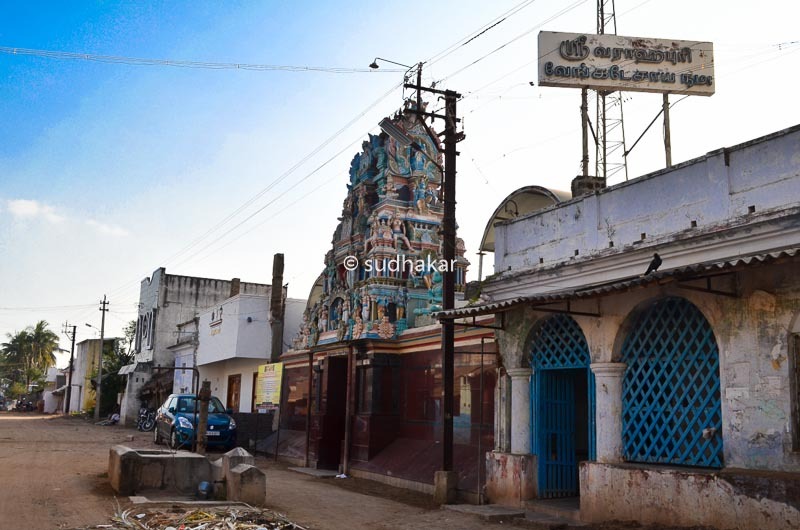 The temple is about 10kms East of Koviladi Divya Desam on the Thirukattupalli-Kandiyur road. Buses from Thanjavur to Kallanai via Varagur (25kms). Buses take over an hour to reach Varagur. Where to Stay? There are no hotels here. The best place to stay is in Thanjavur. However during the Uriyadi utsavam days, many homes serve as guest houses free of cost. Other interesting places around Varagur There is an old Lord Siva temple as you enter Varagur. 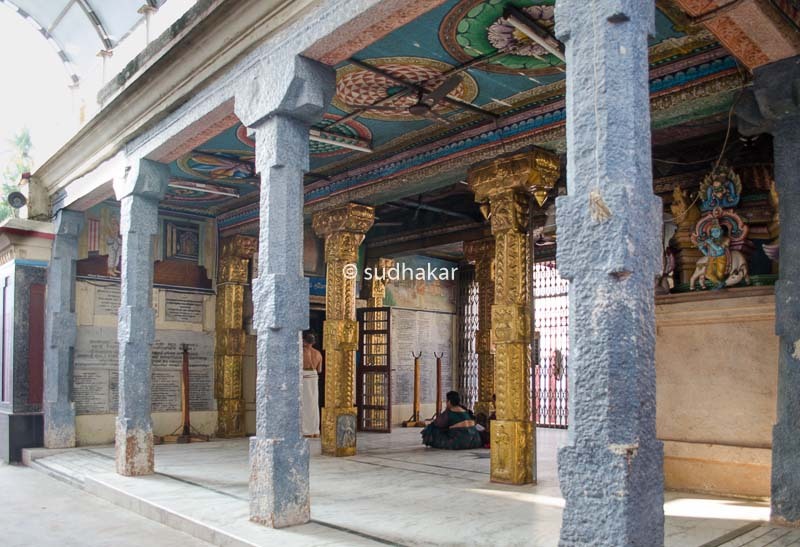 This temple is also as old (or even older) as the Venkatesa Perumal Temple. Thanjavur, Thiruvayaru ( Sivan temple and Sri Thyagaraja swamigal adishtanam), Kandiyur ( famous for one of the 108 Divya Desams and Sivan Temple), Koviladi ( one of the 108 Divya Desams around 10 kms from here) are some of the places you must visit. Sri Lakshmi Narayanar Temple, Varagur -613 101, Thanjavur district.